INTERVIEW: Sheridan Prasso - Writer of the book "The Asian Mystique"
Member of "String Cheese Incident"
WHAT IS THE MAIN FACTOR/ELEMENT THAT DRIVES YOUR SOUL'S CURIOSITY TO EXPLORE AND DISCOVER THE MANY DIVERSE MUSICAL PASSIONS THAT EXISTS WITH WONDER? YOUR ECLECTIC MUSICAL JOURNEY (AND THE BAND) SEEMS TO BE INFLUENCED BY MUSIC FROM MANY SOURCES. WHO INFLUENCED YOU THE MOST AND WHY? Davis Grisman influenced me a lot because he opened up the mandolin to a lot of other music. Brazilian music is based in mandolin. 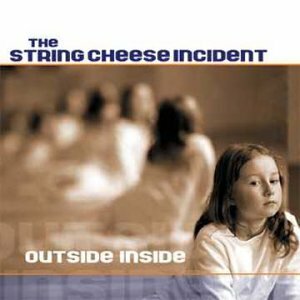 DID LIVING IN INDONESIA, KOREA, ENGLAND, GERMANY, NEW YORK, ALASKA AND COLORADO START YOUR INSATIABLE THIRST AND INTEREST IN THE MANY DIVERSITIES IN THE MUSIC THAT YOU'VE INCORPORATED WITHIN STRING CHEESE INCIDENT? IF SO, HOW? As a kid, I never listened to a lot of music. As the result of not being brought up in the United States, it wasn't part of my environment. Now I listen to a lot of music such as jazz, Grateful Dead, Santana, etc. and a great number of other artists. YOU MENTIONED IN A PREVIOUS INTERVIEW THAT PLAYING STRINGED INSTRUMENTS (AS OPPOSED TO THE PIANO) ARE AN IMPORTANT PART OF YOUTH IN KOREA (YOUR BIRTHPLACE) AND JAPAN. DID THIS PLAY A STRONG ROLE IN YOUR CHOICE OF INSTRUMENTS? ARE THERE MANY KOREAN/JAPANESE MANDOLIN PLAYERS? I went from violin to mandolin/guitar because the "violin" background made it easier to learn music. I started playing violin in England and only started playing a lot when I started living in the U.S.
ARE YOU WELL KNOWN IN KOREA AND/OR ASIA? WILL AND/OR HAVE STRING CHEESE INCIDENT PERFORM IN ASIA? IF NOT, WOULD YOU WANT TO PLAY THERE? Neither String Cheese Incident, nor myself, are presently known in Asia. 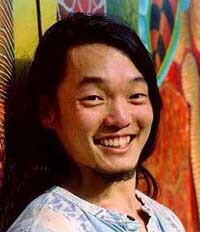 SCI (String Cheese Incident)), though, might visit Japan during the 2002 tour. YOU MENTIONED THAT MANY CLASSICAL VIOLIN/STRING PLAYERS HAVE A FEAR OF NOT BEING ABLE TO MOVE INTO OTHER AREAS, SO WHAT DO YOU THINK ABOUT ARTISTS SUCH AS YOYO MA, VANESSA MAE, MARK O'CONNER (FIDDLE PLAYER), AHN TRIO, ETC. VENTURES INTO OTHER MUSICAL GENRES? The mandolin doesn't have the "restrictions" of a classical instrument. There is an openness to play whatever you want to play. It's a natural progression. It is also a natural option to explore other music. that started on time, played up to the time curfew, played 3½ hours of pure music from just the headlining group at a venue filled with adoring fans that follows them from place to place. Imagine a concert where the fans are standing for the vast majority of the time, singing their songs, dancing to the music and rejoicing to all the recognized songs. Imagine that the performing group not having a major record label support, large promotional support dollars, airplay on radio, videos on MTV and/or appearances on MTV's TRL receiving these accolades. Imagine a concert where entertainment, hype, the latest "rage" or "hit" song and the temporary adoration to the "personality of the week took a back seat to music. Imagine a concert where music would reign! of a group filled with legions of devoted fans that destroys the prevailing stereotypes of how to achieve success. The joy of an audience and artist communicating at the same level was very apparent from the beginning of the concert. Evidence was seen via the audience giving shouts of exuberating to melodies to the recognized songs that provided String Cheese Incident impetus to ever greater musical flights of discovery. THE GROUP'S COLLECTIVE TALENTS made the anticipated lulls within their 3½ hour concert preparations for the various creative surprises from their various improvisational and impromptu musical interludes that was spearheaded by the playing of Kyle Hollingsworth on keyboards, Bill Nershi on guitar and Michael Kang on mandolin/violin/guitar/vocals. COULD YOU ELABORATE ON YOUR LYRICS ON RACE AND CONSCIOUSNESS IN THE SONG YOU WROTE ENTITLED "ROUND THE WHEEL'S COME AS YOU ARE?" DID SCI REALLY RECORD THE BLUEGRASS VERSION OF "GIN AND JUICE" THAT KEEPS SHOWING UP ON THE INTERNET? The group hasn't played the song. With SCI (String Cheese Incident) constantly improvising and not perfectionists, they've might have played music similar to the song. HOW DOES IT FEEL TO BE THE YOUNGEST BAND MEMBER AND WHAT DIFFERENT PERSPECTIVES DOES THAT BRING TO THE BAND? Kyle (keyboard player) is the next youngest at 30. The oldest player is 40 (Billy), Travis is 36 There is a mutual respect within all the members. Once you've reach 30, there is a sense of maturity that can only be acquired only time. SCI (String Cheese Incident) mostly just "learns" the music without charts. YOU'VE PLAYED AND/OR A FAN OF PEOPLE SUCH AS BRUCE HORNSBY, LITTLE FEAT, BUNNY WAILER, JEAN LUC-PONTY, PAT METHENY, WES MONTGOMERY, JOHN SCOFIELD, FEMI KUTI (FROM AFRICA), MERL SAUNDERS, SANTANA (IN TEXAS), STANLEY JORDAN, DAVID GRISSMAN, PETER ROWAN, ART NEVILLE, PHIL LESH, BELA FLECK, SAM BUSH, AND WARREN HAYNES AND BOB DYLAN - WHO WOULD YOU LIKE TO PLAY WITH THAT YOU HAVEN'T HAD THE OPPORTUNITY AND/OR WOULD PLAY WITH (IN LIGHT THAT STRING CHEESE INCIDENT DOESN'T PLAY WITH OTHER GROUPS DURING CONCERTS)? SCI (String Cheese Incident)) likes/prefers to play with other people. We always play with other groups in "festival" settings. DESPITE YOUR CLASSICAL BACKGROUND, THERE HASN'T BEEN MUCH OF A CLASSICAL INFLUENCE IN STRING CHEESE INCIDENT'S MUSIC? YOU MENTIONED IN A RECENT ARTICLE THAT THIS IS THE NEXT MUSIC GENRE TO BE INCORPORATED WITHIN STRING CHEESE INCIDENT. HOW DO YOU ENVISION IT THAT IT WILL BE INCLUDED - MOZART SONATAS? Because some of the classical composers have a different ideas of going through the changes, the group has interest in this musical direction.. IN YOUR LAST C.D., IT SEEMS THAT YOU'VE ADDED SOUNDS/SONGS THAT SOUNDED LIKE PAUL SIMON'S GRACELAND. WILL THERE BE AN INCREASING AMOUNT OF AFRICAN AND SALSA-TYPE MUSIC (RECORDED AND LIVE) WITHIN STRING CHEESE INCIDENT? They've done more Trinidad/Island styling and influences that are heard within the music of String Cheese Incident. IN YOUR NEW C.D., THE FLIGHTS OF VARIOUS MUSICAL FANTASIES (I.E. BIRDLAND IN BLUEGRASS AND ROCK ON 1ST C.D.) WERE NOT HEARD OFTEN, MORE OF A SONG FORMAT, NOT AS MUCH VARIETY AND LESS OF YOUR MANDOLIN PLAYING - IS THIS REFLECTIVE OF THE NEW DIRECTION(S) OF WHAT THE BAND WILL BE PLAYING LIVE OR JUST FOR C.D. TO MAKE A MORE COHESIVE RECORD? It's similar to how Chicago (another jam band) changed when they started working with David Foster. Unfortunately, also like most jam bands, they're forced to sacrifice some of that diversity in the studio if they want to make a cohesive record. Already started working for the next c.d. We've already started working the next c.d. which might be an acoustic c.d. TELL US ABOUT HOW YOUR SIDE PROJECTS FULFILL YOUR OTHER MUSICAL ADVENTURES AND THE DIFFERENCES BETWEEN COMOTION AND THEORY OF EVERYTHING? DO YOU HAVE ANY ENDORSEMENTS, SINCE YOU'RE USING A PAIR OF K & M ANALOG DESIGNS' EMERALD 50'S? (EMERALD 50 / 50 WATT HEAD WITH REVERB - VACUUM TUBE2 CHANNEL AMPS) AND A 5 STRING VIOLIN FROM ZETA? DO YOU WORK IN INSTRUMENT IDEAS AT ZETA WITH PEOPLE SUCH AS ROB WASSERMAN? I presently don't play Zeta violins and just using an acoustic violin. WHAT WORDS, EMOTIONS AND/OR IMPRESSIONS WOULD YOU WANT TO LEAVE WITH THE PEOPLE THAT SAW YOU PERFORMED? There is a lot of joy to be experienced in life. We're all trying to enjoy life, that's our major purpose and enjoyable for others and make us human. In addition - "JazzFest" is not just a jazz festival, it's a music fan festival filled with great musicians.